"Syntax is concerned with the sentence as the unit of language, combining our description of events with our communicative inventions, and 'grounding' all this into the reality of our here and now. This composite whole is put together in the linear structure or the word order of the sentence." Dirven, René & Marjolijn Verspoor (2004) Cognitive Explorative in Language and Linguistics, 96. This module deals with sentence structure and inspects how words are combined into larger strings or chunks. This branch of linguistics that looks at sentence structure and how words are selected and arranged in order to form sentences is called syntax. In a way, syntax resembles morphology in that morphology analyses language as well. 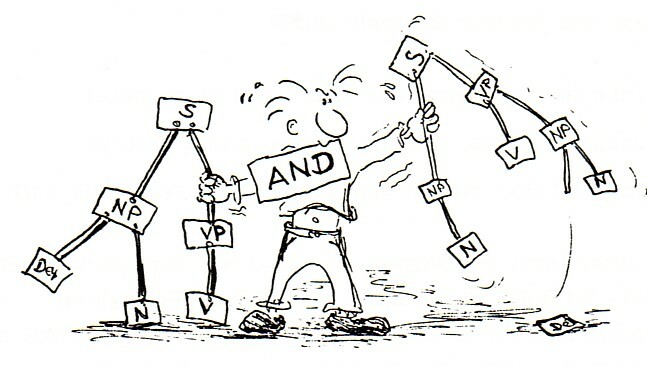 While in morphology, the particular focus is on complex words, such as charming, better or revealed, in syntax special emphasis is placed on the description and analysis of larger strings or chunks of words (as in I absolutely loathe doing linguistics; he missed my introductory classes in cognitive linguistics, because he had been in prison; or a stupendous achievement). In some linguistic textbooks, syntax has become synonymous with grammar.